Huge recovery day after the news out of France and Greece on Sunday evening. But we’re still in a down trend and so this was just a short covering rally (IMHO). When (and if) we break through 1,350 we’ll get some real fireworks. Look out over the next couple of days. Everyone is trying to play down the French news and say it won’t be destabilising to the European accord that has so far been agreed to fix their sovereign debt problems. And seeing the footage out of Paris, the man in the street appears to think Hollande will fix everything. Naive – and shame on the politicians for making the populace think they have the right answers. The truth is Hollande bribed the suckers by promising them to reduce the retirement age and tax the rich. And they fell for it – one of the most thoughtful, well read, informed countries in the world. People just hate hard work and struggle. Measure the speed to the server delivering the data – not your local server. In my case this is the difference between measuring the speed to a local suburb in Australia versus Texas (where the TradeStation data servers are). Measure network latency as well as throughput. They both impact response time. My local server gave results of 60+ MBps throughput and 10 ms latency. The Texas servers gave results of 2-4 MBps throughput and 250 ms latency! Now don’t forget these measurements are being made from Sydney, Australia – hopefully if you’re in the US your stats are way better. But it does explain partly why my Internet connection speed upgrade made so little difference to my chart load times. Here is the original article with video of my internet connection speed. Off topic. 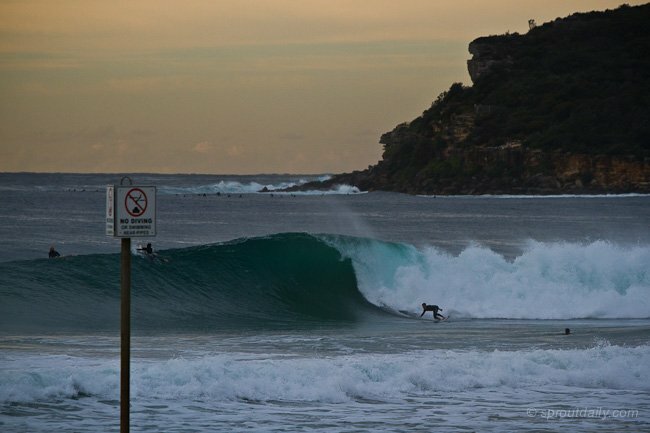 Here in Manly, Sydney, just had 3 of the best days surf all year. Barrels left and right, plus dolphins in the warm water. Amazing when you think this is a commuter suburb of a major city. HT to Sprout Daily for the photo.